When the weather gets nice, we go riding. Well, that statement is only partially true. The weather was supposed to be nice in Chicago all day Saturday, but apparently some fog and mist settled over the city and didn't leave until early afternoon. I wouldn't know though--I left hours earlier for Wisconsin to ride the Kenosha Bike Club's century. Well, 62.5 miles of it to be almost exact. 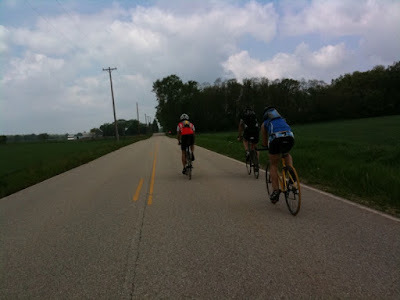 That's three of us--me holding up the rear--on the homestretch back to Waterford Union High School, and the fourth was taking the picture while pedaling (let's just say I was super-impressed as I can't even eat solids or gels while I ride). So...how'd you spend your Saturday? Photo by Johnnie Seward.